No one said that finding out what the universe is made of and how it works would be easy. But at CERN, the European Organization for Nuclear Research, thousands of scientists are trying to do just that every day. The development team at CERN has created many applications including the ROOT platform, a big data analysis for its High Energy Physics computing. These applications are used by more than 20,000 users to create cutting edge scientific software. Understanding that the quality of their application is critical for its large customer base, CERN adopted Agile practices like Continuous Integration (CI) and testing. 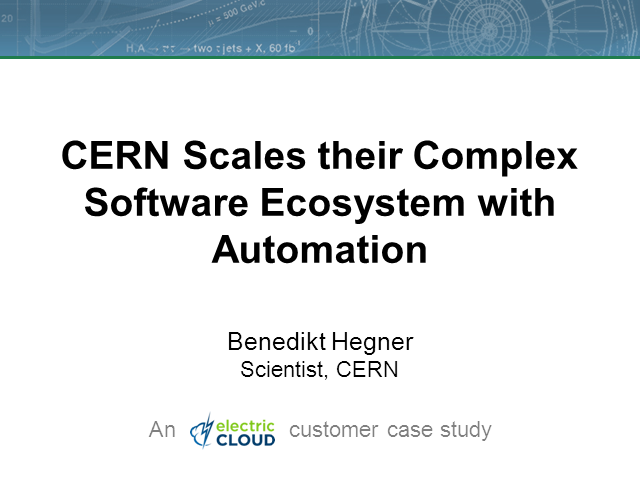 Please join this European webinar to hear how CERN implemented Electric Cloud’s scalable automation solution to build and test their complex software applications to improve their code quality and increase their release frequency.